I have always been a lover of skincare products. I love the evening ritual of using a good face cream or serum. A few years back I started looking at how skincare products are tested. The fact that we still have animal testing for cosmetics astounds me, so I stopped supporting a couple of skincare brands that continue to test on animals. Then I turned my attention to what is in skincare products. Cue more horror. And so I entered a wilderness of skincare where I didn’t really know where to turn. Often products that are natural and cruelty free are not the best quality and as I have sensitive skin, I would often react to them. Organic and natural skincare is often pricey and I spent a lot on products that I would potentially react to. I became more and more limited with choice until I decided to start making my own. Ecomonical as the bottle of oil last a LONG time. 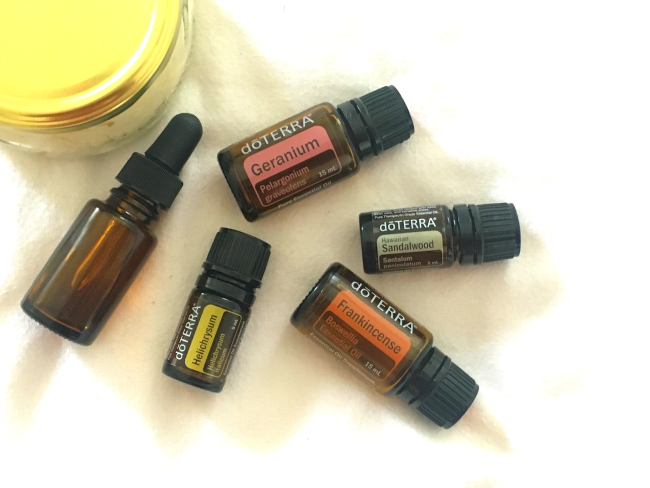 There are some essential oils that are incredible as part of an ati-aging skin regime. Here are the best ones for you. After I have told you about them I will tell you how to make your OWN anti-aging serum! This serum is amazing- smells so good and my skin feels and looks better after only a week using the serum! Frankincense is the King of Oils and is a powerful healing oil. This oil has the ability to strengthen skin and improve its tone, elasticity, defense mechanisms against bacteria or blemishes, and appearance as you age. It can also be beneficial for fading of stretch marks, surgery scars or stretch marks. Frankincense can also help in the appearance of sunspots or age spots and is a powerful astringent, meaning it helps protect skin cells. Frankincense is a critical essential oil in preventing and treating aging skin. The oil tightens and firms skin, which makes it THE most important essential oil for anti-aging! With its beautiful flowery scent, Geranium essential oil is one of the best essential oils for both skin and hair. Its natural astringent properties tighten skin thereby reducing large pores, regulating sebum as well as toning & firming aging skin. This essential oil also promotes cell renewal and proper blood circulation. In addition Geranium essential oil offers antioxidant properties. The natural astringent properties of Sandalwood essential oil help tighten, firm & improve the tone of aging skin. Using sandalwood essential oil protects skin cells from UV radiation and sun damage. It contains potent sesquiterpene compounds and skin regenerative properties that improve circulation and promote smoother looking skin. Helichrysum essential oil is widely used in skincare preparations, usually for anti-aging purposes. It has incredible healing properties for tissues, particularly skin. The benefits of Helichrysum essential oil are said to occur at a cellular level, restoring the cell structures that spread and thin with age. Myrrh has long been used as a perfume, incense, and medicine in Africa and the Middle East. One of its most common forms is as an essential oil. It has been proven to heal wounds and is packed with anti-oxidents. This will help reverse aging in the skin. Myrrh essential oil can be used topically to smooth out aging skin and prevent under eye wrinkles from forming. Lavender is another incredible oil for skin. Lavender helps heal skin issues, burns and cuts. Another anti-inflammatory oil, Lavender essential oil is a go-to for safe and restorative skin treatments. It soothes, calms and restores skin tissues. This skin serum is incredible. Filled with nourishing carrier oils and anti-aging essential oils, it will hydrate and feed your skin. I have used Frankincense, Geranium, Sandalwood and Helichrysum. You can also substitite/ add Myrrh or Lavender. You will need a glass botttle/ vial. I used an empty clean 15ml dōTERRA oil bottle as the glass quality is very good. And I have 4,000 of them! You will also need a dropper, I got mine here. The best carrier oil is Jojoba. It is nourishing and ligh weight (non-greasy). This is an essential component of the serum. Vitamin E oil which includes fat-soluble antioxidants that supply nutrients for your skin to help you age slower. An oil high in anti-oxidants is next, like Pomegranate seed oil or Raspberry seed oil. Another option, which I may try next time in place of either the Vitamin E oil or the Raspberry seed oil, is Rosehip oil. Apply 4 to 6 drops to the face and neck morning and night. This is not an exact science and the quantities are approximate. However these quantities have given me the most amazing face serum so I would start here. This face serum is effective, economical and smells divine, what’s not to love?